BISS 5.26.11 - Zion I / B-Side Players / Tracorum / Carnaval/ Happy Memorial Weekend! Happy Memorial Day Weekend BISS Listers!! 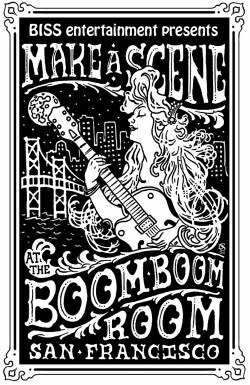 If you are in the North bay tonight head to the Hopmonk to catch, "ZION I + MALARKEY & HOOK BOOG"!! *WIN!! And if you are still in the North Bay on Friday and Saturday night, KARL DENSON & HIS TINY UNIVERSE orbit the Hopmonk! The Carnaval Festival is happening both Saturday & Sunday in The Mission all day on Harrison Street between 16th and 22nd Street. The Parade is on Sunday @ 9:30am down Mission street. There is music all day both days on three stages. Check the schedule to find out when & where your favorite artists are playing: http://www.sfcarnaval.com/entertainment-2011/ BISS Favorite Ronkat is at 2pm on Sunday @ the 17th Street Stage. Carnaval Fever continues all weekend at Brick and Mortar with B-SIDE PLAYERS on Friday night (*WIN), Monophonics on Saturday (*WIN), and FORRÓ BRAZUCA on Sunday (*WIN)!! Saturday, the BISS Hoop It All Out Crew is gonna be out in full force for local live music and healing in Dolores Park from noon to 6!! Bluegrass and Americana music will be performed by Howdy. Massage Therapists will be close by providing Shiatsu Massage for $35/hour (~50% off). Finish your weekend off right with the TRACORUM anniversary show at Mojito. The BISS crew will be there celebrating, and the princess might even have some new dance moves. Then why not just spend the night in North Beach 'cause Mondays aren't manic with free Jazz at Grant & Green with Mike Olmos & Joe Cohen at Mojito.. Sunny says be sure to start checking out THE PLEASURE SESSIONS every Wednesday at The Boom Boom Room.....they get an awesomeness times 11....totally. Also next Wednesday is Storm Large at the Red Devil Lounge! She rocks! Summer festival season always starts in the bay area with Harmony Festival. The 33rd Harmony Festival is on June 10 - 12, 2010 at the Sonoma County Fairgrounds in Santa Rosa, CA. World-class music, speakers, Techno-Tribal Dance, Action Sports Zone, 300+ vendors, camping. This years line includes: Michael Franti & Spearhead, Railroad Earth, David Nelson Band with Jesse McReynolds, Moonalice, DJ Pleaseuremaker, The Flaming Lips, Grace Potter & The Nocturnals, Rootz Underground, Jose Netoband with Steve Kimock, Primus, Edward Sharpe & The Magnetic Zeros, SOJA, Krishna Das & Friends, Classical Revolution. BISS will be giving away tickets for Harmony festival DAY shows as well as the night shows including the Soul & Roots Night on Friday night featuring SOJA, G. LOVE & SPECIAL SAUCE, ROOTZ UNDERGROUND, GAUDI & QUIXOTIC!! Watch for chances to win in the upcoming weeks!!! Make A Scene with BISS on the third Thursday of Every Month! You never know what special guests might show up!! Don't forget to be all the BISS you can be. The electric light-up scarves from Earthkin Creations are still available for $100 each (down from $150!!) Email biss@bisslist.com if interested. PICK (at least) ONE OF THESE 4 contests and send your answers in an email to biss@bisslist.com with the show & date for the show you want to win in the subject line. Please be sure to request a show that says **Win Tickets** next to it. We try our best to spread it around so that everyone wins! Funky, Fresh and FREE Friday Night SHOW! KARL DENSON\'S TINY UNIVERSE 2 NIGHTS!! NEW! SNEAK PEEK Tickets Now On Sale! SAVE UP TO $120! when you Buy NOW! Early bird 4-day Passes are now available for $185 through May 2nd. All multi-day tickets include camping.